Winslow Homer had always been profoundly inspired by the sea. In 1882, after spending over a year and a half in England where he had made numerous paintings of the fishing community in Cullercoats on the North Sea, Homer returned to America and established his studio at Prout's Neck, Maine, where Homer family made its summer home. Living and painting at this point where sea meets land, Homer confronted some of the great themes of man and nature. As he had done in England, Homer continued to depict fishermen at their daily work, drawing numerous small sketches and completing large canvas. Of these, The Fog Warning is one of the most celebrated. During the summer of 1884, Homer traveled to Cape Ann, Massachusetts, to observe and draw the Gloucester fishing fleet. Sketching in charcoal while sailing on board the schooners, he would later combined the drawing for larger compositions in oil. Perhaps influenced by the fishermen he met or the stories he heard while sailing with them, Homer repeatedly sketched and painted the theme of work and isolation from different viewpoints, reinforcing the solitary aspects of the fisherman's lot. 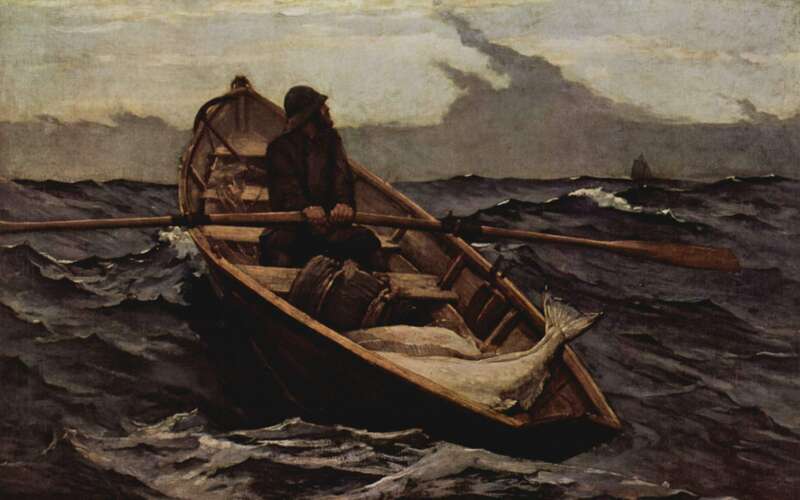 The Fog Warning shows a single fisher man rowing a dory with two or more large halibut weighting down the stern; the man has paused in his rowing as the boat crests a wave, and he looks off in the direction of a large sailing vessel on lower portion of the sky, a "long and ominous cloud", as it was called by one reviewer. When it was initially shown, the painting was apparently called Halibut Fishing, but Homer seems to have taken pains to correct that. "Winslow Homer's picture," wrote the Boston Evening Transcript, "must be introduced anew, as this name was not given by its original sponsor. The real name is 'The Fog Warning." As the latter title makes clear, the painting represents what was an all too common peril, namely the "constant danger, at all seasons of the year, of fishermen, while out in boats, losing sight of the vessels." Although the mother ship would commence sounding a horn as soon as an approaching fog was spotted, the widely scattered fleet of dories could easily and rapidly become enveloped in the mists before reaching safety. The Fog Warning, a distilled image of that intense moment when the fisherman must decide on a new course to row if he has any chance of reaching the ship, is one of Homer's most successful epics of the sea. In The Fog Warning, Homer synthesized several themes common to his works from the mid-1880s. Similar to The Herring Net which depicts and abundant catch of herring. The Fog Warning recalls harvest themes through the large halibut displayed in the bottom of the dory. The thrust of The Fog Warning is ambivalent: the sea is both provider and adversary. The fisherman, isolated against the fog bank, is caught in an ancient struggle.